Every guitar player will need to learn tab eventually. When you can find it, a well-written guitar tab provides you with all of the information needed to expertly perform a piece of guitar music, including information that is highly specific to the instrument that may be harder to express using standard music notation. Tab shows you how to play guitar notes by showing you where to press down and on what string. Looking at the example, the top line is actually the high, thin “e” string and the bottom line is the low, thick “E” string. To many holding a guitar in their hands for the first time, this notation seems counterintuitive. After all, the thickest string is on the top when you hold a guitar. But there are many good reasons for writing tab this way. The first is that when the notes are positioned in this way, notes move up as they go higher. So going across the strings to higher notes results in a visualization on the guitar tab of the notes reading higher. There are two ways to get notes to go higher, though: one is by moving across the strings towards higher notes. Another is by moving up the neck towards higher frets, and thus higher notes. Whenever you read a guitar tab, the first thing you should do is check to see if there’s any special information about guitar tuning or capos. Some guitar music is written in alternate tunings. That means one or more of the guitar’s strings is tuned to a different pitch than those used in standard tuning. The best example is probably the common “drop D” tuning. In this tuning, the guitar starts in standard tuning: EADGbe. Then the low “E” string is tuned down a whole stepA step whose width is two semitones. to D. The result is you can play a low D bass note easily by playing an open string. This is very useful for music in the key of D, where this note will be needed often. Other music may involve retuning every note on the guitar, and sometimes drastically. This is all to allow the same six strings to produce new and interesting combinations of sounds. Another example is the “open D” tuning: DADGF♯AD. Once you’ve changed to this tuning, every open string note you play will be a note from the D major chord, making it a wonderful tuning for compositions using lots of open strings. You will often see that the tab calls for a capo to be added to a particular fret. For instance, “Capo III” means to apply a capo to Fret III. Then you pretend Fret III is the open position. So the capo basically only affects open strings. Although it does also mean that you can no longer play notes below the capo. If a tab calls for a capo, you can play it without. But it will be in the wrong keyThe set of pitches that a piece of music is organized around. A key has two components: a tonal center and some sort of scale, or set of pitches used for creating harmony and melody.. Recommended capo: Error. Link not found.. Unfortunately, one main shortcoming of guitar tabs is that most of them lack reliable and consistent rhythm notation. Since guitar tabs are often “crowd sourced”, and produced by (skilled) amateurs, the quality of most tabs is poor to middling. Some tab authors attempt to show the rhythm by the spacing between the notes. The only correct way to do it is to actually write rhythmic notation including stems and rests. For better-quality tabs, check out Songsterr. 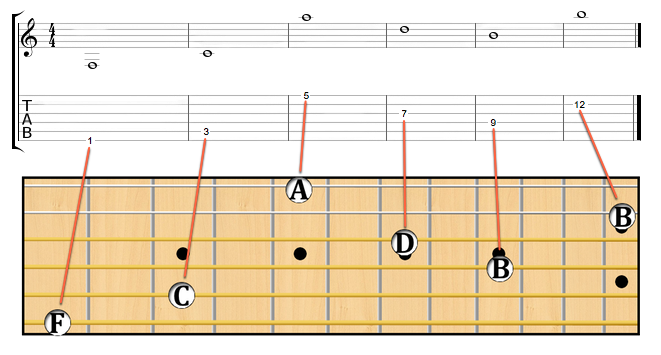 The stems above the fret numbers (along with the rests) help show accurate rhythmic values. Without this information, the rhythm would not be clearly understood simply by looking at the notation. Notes are normally expressed by numbers. Each number is positioned on top of one of the strings, indicating which string you use to play that note. A zero (“0”) is for an open string. If the note is fretted, a number is written indicating what fret to play. Other special techniques may be expressed by conventions of notation, sometimes inconsistent with each other. The tab may have a “key” instructing you how to play certain techniques. Or you might just need to interpret yourself. These are some of the most common special techniques you’ll encounter in tab. An arc drawn over the notes typically indicates a hammer-on; linking the notes without re-articulating the second. The letter “H” is sometimes added. An arc drawn over a descending pair typically indicates a pull-off. The letter “P” is sometimes also added for clarity. The standard notation makes bends look a little bit complicated. The tab is a little more helpful, showing the half-step bend, followed by a release. Of course, this is the XIIth fret so a naturally harmonic works. But similar notation could be used for artificial harmonics, such as at the XIIIth fret. A slide is written with a diagonal line showing one note sliding to the next.